The 125cc 4-stroke Zuma – at home on unpaved roads with the attitude you want for the street. 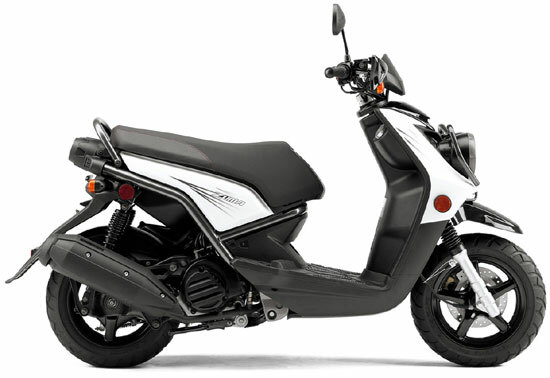 Check out the fun loving, sporty, 2010 Yamaha BWs 125 (called the Zuma 125 in the USA). The ever popular 2010 BWs 50 (called the Zuma in the USA) has a larger sibling. The increased engine displacement and more roomy design expands the functionality of the BWs/Zuma 125, making it a great urban commuter or fun riding machine. Even more for a very good thing. Tough and rugged meets practical. You also get a fuel injected four-stroke engine, fully automatic transmission and pushbutton electric starting. Plus room for two to ride and gear storage inside. ” That tough off-road look isn’t just for looks: the strong steel frame; fat, aggressive tires; oiled-type air filters; beefy shocks front and rear and off-road style brush deflectors make this scooter at home on unpaved roads while delivering all the attitude you could want for the street. ” 125cc 4-stroke engine with 4 valves, a 10:1 compression ratio, ceramic-composite cylinder plating, and electronic fuel injection gives this new-generation Zuma a new level of performance. ” Fully automatic C.V. transmission and pushbutton electric starting make the Zuma super-convenient transportation. Both center and side stands, along with a locking cover on the ignition switch, make it convenient to park, too. ” There’s room for two atop this new-generation Zuma’s seat, and lots of locking storage beneath it. 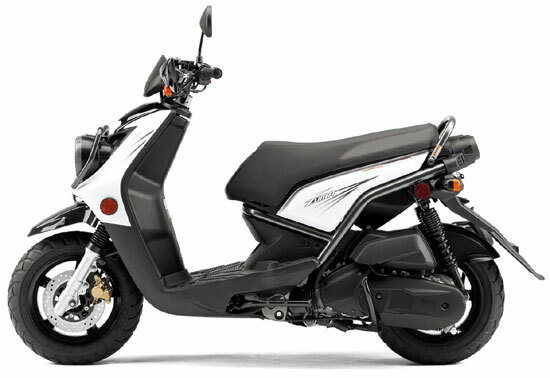 ” The Zuma 125 achieves fuel economy up to an estimated 89 mpg* with a fuel tank that holds 1.6 gallons of gas. ” Zuma’s fuel-injected, 125cc single cylinder, 4-stroke engine pumps out lots of power for its size, using an SOHC 4-valve head with 10:1 compression ratio and ceramic-composite cylinder plating. 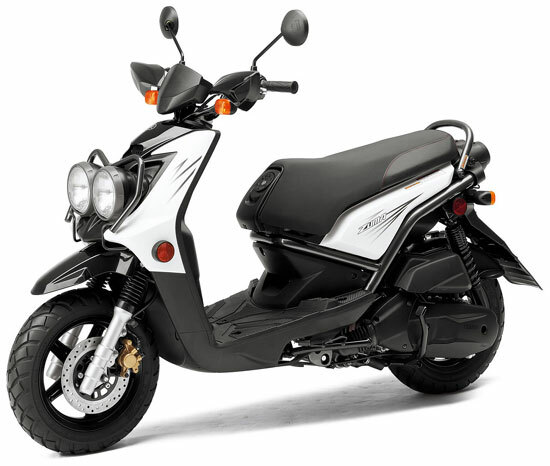 ” Pushbutton electric starting makes the Zuma 125 super-convenient for transportation. ” For reliability and easy maintenance, simple wet-sump lubrication is used. The centrifugal oil filter built into the crankshaft means there’s no messy oil filter to replace. ” Forced air cooling system helps keep engine temperatures under control, even while idling at stoplights, for maximum efficiency and longer engine life. ” Fully automatic, V-belt transmission with centrifugal clutch provides easy, twist-the-throttle-and-go operation with great off-the-line acceleration. ” Fuel injection provides the optimal fuel mixture for the operating condition, including temperature and altitude, and that means easy cold starts, too. ” Oiled-paper type air filter helps trap dirt before it gets to your engine, even when riding on unpaved roads. The V-belt housing has its own off-road-style wet-foam air filter for durability. ” Upswept muffler incorporates exhaust catalyst technology to reduce air pollution and meet emission regulations. ” Hefty steel-tube frame has a step-through design for easy mounting. A two-stage electrodeposition and electrostatic painting process provides a durable, corrosion-resistant finish. ” Telescopic fork features beefy outer tubes for strength, while slider shrouds help protect the 27mm inner tubes from debris. ” Swingarm has double rear shocks for riding comfort on the street and unpaved roads, too. ” Fuel tank holds 1.6 gallons for plenty of cruising range. Fuel tank emission system includes a charcoal canister to control gasoline evaporation and reduce air pollution. ” Fat 120/70-12 front and 130/70-12 rear tires have an aggressive looking block pattern for great handling on unpaved roads and on the street. Tires run on lightweight five-spoke die-cast aluminum wheels. ” 220mm hydraulic front disc and rear drum brakes combine for serious stopping power. ” Zuma provides both a centerstand and side stand for parking convenience. ” Two bright halogen headlights light the way-following current sportbike practice, the left side provides the 55W low beam while the right side is the 60W high beam. ” For extra security when parked, the main switch is equipped with a key hole lock cover. ” The underseat storage compartment’s cavernous 5.2-gallon capacity is roomy enough for a full-face helmet. 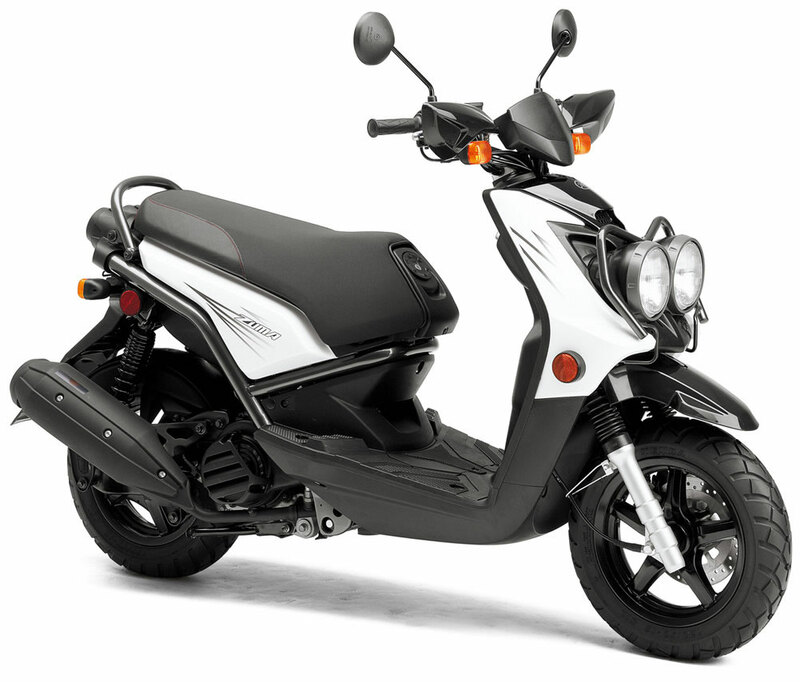 ” The Zuma 125’s easy-to-read analog speedometer is flanked by a fuel gauge and indicator lights. ” Peppy, 124cc, air-cooled (with fan assist), SOHC, 4-valve, 4-stroke engine produces solid, predictable power and excellent fuel economy. ” Fuel consumption of 37.5kpl/107mpg. Your actual consumption may vary. ” Fan-assisted cooling system maintains consistent engine temperatures, even while idling at stoplights or in stop and go traffic for maximum efficiency and extended engine life. ” 16 bit ECU (electronic control unit) is used to control the fuel injection and ignition systems. ” Four valve cylinder head design utilizes two intake valves and two exhaust valves for maximum breathing efficiency and great power output. Valves are operated by rocker arms. ” Both the intake and exhaust valves feature a special “carbon cutter” design which removes any carbon build up from the valve stem, keeping the engine operating at maximum efficiency, even during extended slow speed use. Carbon build up on the valve stem can lead to sticky valves and poor performance. ” The light weight aluminium cylinder features a ceramic composite coating on the cylinder bore which insures uniform heat dissipation, reduced friction, reduced weight and an extended service life. ” A wet sump-type oil delivery system is utilized. A special centrifugal oil filtering system is used. This type of oil “filter” automatically removes any particles found in the oil and never requires cleaning or maintenance. ” A flat top “gravity” cast lightweight aluminium piston is used to provide fast engine response. ” 33mm throttle body fuel injection provides crisp throttle response, reduced fuel consumption, reduced emissions and reduced weight. Other fuel injection benefits include no choke or idle adjustment to fuss with … it is all controlled automatically. ” Oil coated paper-type air filter is used. The air box is designed for excellent performance and reduced intake noise. ” Fully automatic, V-belt, C.V.transmission ensures easy “twist-the-throttle-and-go operation”. There is no hand clutch or gear shifting to worry about. A wide range reduction ratio is used for peppy performance. Washable foam air filter allows cooling air to enter the belt case for reduced heat and extended V-belt life. ” AC magneto produces 170 watts of power. ” Stylish upswept muffler contains a catalytic converter to reduce harmful hydrocarbons and nitrous oxide exhaust emissions. The muffler produces a quiet exhaust note. ” 27mm hydraulic front fork delivers excellent bump-absorbing performance and comfort wheel travel is 78mm (3.1″). ” Dual-shock rear suspension provides a plush, comfortable ride wheel travel is 71mm (2.8″). ” 220mm hydraulic front disc brake with single piston caliper and semi metallic pads provides excellent stopping power. ” 150mm rear drum brake supplies strong, reliable stopping power. ” Rugged, yet lightweight die cast aluminium 5-spoke “mag style” wheels are fitted with wide, aggressive tubeless tires. ” Ultra convenient 20 litre, under seat storage compartment can hold selected full-face helmets or other items. Note: This compartment will not hold all full face helmets. ” Dual 60/65-watt, multi-reflector, quartz headlights maximizes night time visibility and enhances the BWs rally styling. ” Full-size floorboards and wide front apron provide excellent splash and wind protection as well as highlighting the BWs aggressive sports styling. ” Sporty instrument panel includes analog speedometer, odometer and electric fuel gauge, plus a range of warning lights. ” Hand guards help protect hands from the cold and add a special styling touch too. ” Easy-to-use centre stand plus side stand. Side-stand safety lock-out switch prevents unit from being ridden when side stand is down. ” Anti-theft 3-in-1 main ignition switch combines the ignition, fork lock and under seat storage compartment lock in one convenient switch. This switch also features a special “key hole cover” that blocks access to the key slot to avoid “jimmy starts” using a screw or similar tool.